Without a doubt, this World Series has been a whole lotta fun. Assuming you can stay awake. The two best teams on the biggest stage, throwing nothing but haymakers night after night after night – and, in the case of Game 5 on Sunday, well into the morning on the East Coast. But it’s a stretch to call this baseball. Forget about nuance and strategy and all the things that make the national pastime such an intriguing game, if rather tedious at times. The World Series has been reduced to Home Run Derby on a loop, a bunch of big, strong guys swinging as hard as they can on every pitch with only one goal in mind. Knock it over the fence. The result: Houston 13, Los Angeles 12. ”You’ve got to be kidding me!” said Alex Bregman, who hit a game-ending single off Dodgers closer Kenley Jansen with two outs in the 10th inning. No kidding, the Astros and Dodgers have combined for 22 dingers through the first five games , already eclipsing the previous record of 21 set in the Angels’ seven-game victory over the Giants in 2002. There’s at least one more game to go in La La Land, where the series resumes Tuesday night with the Astros holding a 3-2 lead and looking to clinch the first Series title in franchise history. When it’s all said and done, baseball needs to come clean about what’s going on. A record 6,105 homers were smacked during the regular season, even more than cleared the wall during the peak of the Steroid Era and a staggering 46 percent increase over the total (4,186) from just three seasons ago. After a Series-record eight homers were hit in Game 2 – five of them in extra innings – Commissioner Rob Manfred disputed any suggestion that juiced balls were responsible for that huge spike in the long ball. We’re not talking about a single game, or a single series. This has been going on all season. Something’s going on, for sure, and we can only hope it’s merely tighter stitching and not something far more insidious: a bunch of chemically enhanced sluggers who’ve found a way around baseball’s anti-doping rules. The worst thing baseball could do is bury its head in the sand, as it did before while Barry Bonds, Mark McGwire & Co. were undermining the record book. For now, all we can do is … sorry, I dozed off a minute. Game 5 finally ended after 5 hours and 17 minutes, a wacky, exhilarating, thoroughly exhausting contest that will forever go down in World Series lore. ”The best game ever,” Houston’s Carlos Correa said, as the clock crept toward 2 a.m. on the East Coast. No one even remembered that the night started with two of the game’s best pitchers, Clayton Kershaw on the mound for the Dodgers, Dallas Keuchel taking the hill for the Astros. Keuchel was chased in the fourth – his shortest home start of the season – and Kershaw didn’t even make it through the fifth after being staked to a 4-0 lead. Yuli Gurriel, the guy who made that awful, racist gesture toward Yu Darvish in Game 3, tied it up for the Astros with a three-run shot. Manfred is feeling some much deserved heat for letting Gurriel off the hook until next season, when he’ll have to serve a five-game suspension. In the meantime, he can keep swinging away. Cody Bellinger put the Dodgers ahead with a three-run drive in the fifth. AL MVP-to-be Jose Altuve matched that with a three-run blow of his own in the bottom half. 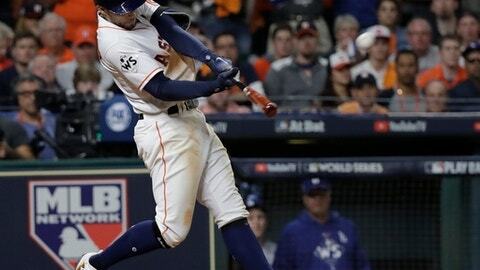 The Dodgers pushed ahead again when Houston centerfielder George Springer misplayed a liner into a triple in the seventh. Springer made up for his miscue with a mammoth homer leading off the bottom half. Correa finished off the seventh with yet another homer, a towering, two-run shot that cleared the wall in left. Brian McCann added a solo homer for the Astros in the eighth, which looked to be icing on the cake of a Houston victory. Yasiel Puig launched a two-run homer in the ninth, pulling the Dodgers within a run, and Chris Taylor came through with a two-out, two-strike single to bring home the tying run. Finally, the Astros won it in the 10th. The only thing that didn’t make sense was the way it ended. With a puny little single.